Bulletin! Discovery of New Portrait of “Shakespeare”! And the Evidence of His Identity Points to the Earl of Oxford! Based on the evidence so far, Griffiths is probably correct! And it all points not only to “Shakespeare” but, equally, to Edward de Vere, Earl of Oxford. 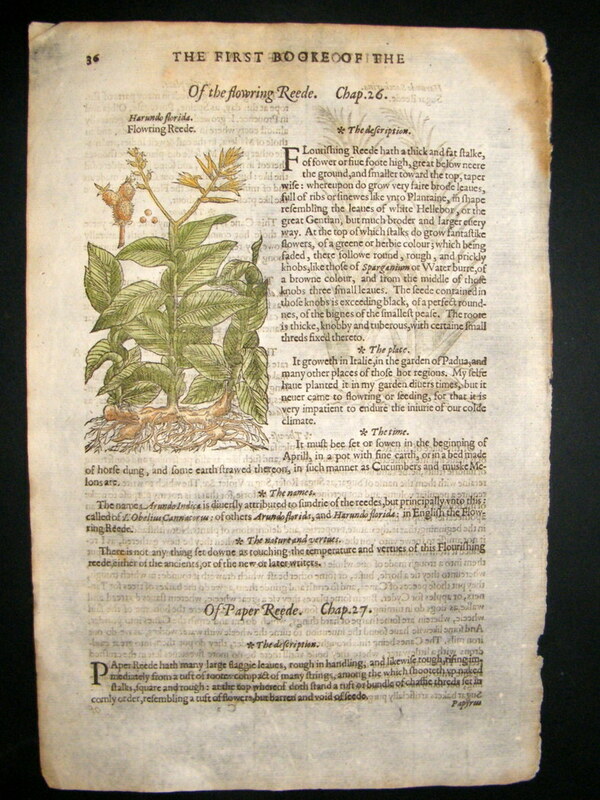 Part of the engraving that appeared in the 1597 book “Herbal” by John Gerard — depicting Shakespeare? Professor Wells may already know the danger that this “literary discovery of the century,” as Country Life editor Mark Hedges calls it, holds for the traditional Stratfordian view. The engraving shows Gerard, author of Herbal, along with Flemish botanist Rembert Dodoens, William Cecil Lord Burghley (Gerard’s own patron) and a fourth man “dressed as a Roman, wearing laurels and meant to make us think of Apollo and poetry,” says Griffiths, who cites visual clues identifying him as the poet who wrote Venus and Adonis (1593). The question, of course, is why “Shakespeare” would be pictured in 1597 along with Burghley, Gerard and Dodoens. The answer, Griffiths says, is that the poet had been involved in the writing of this breakthrough book on plants! “Let us pause for a moment and picture the dwelling in which Lord Oxford was destined to spend the remainder of his minority [1562 to 1571] … One of the chief features of Cecil House was its garden. The grounds in which the house stood must have covered many acres, and were more extensive than those of any of the other private houses in Westminster. Ward adds that Burghley “imbued his sons and the royal wards under his charge with his own keenness in horticulture.” He notes that William Cecil’s second son, Robert, as Earl of Salisbury under King James, placed his splendid garden at Hatfield under the care of John Tradescant, the first of a noted family of horticulturists. And Lord Zouch, another royal ward in Cecil’s charge [1569-1577], later filled his garden at Hackney with plants he had collected in Austria, Italy and Spain. We may be sure that Cecil imbued the young Edward de Vere with that same love and knowledge of plants and flowers – a passion and store of information displayed throughout the Shakespeare works. 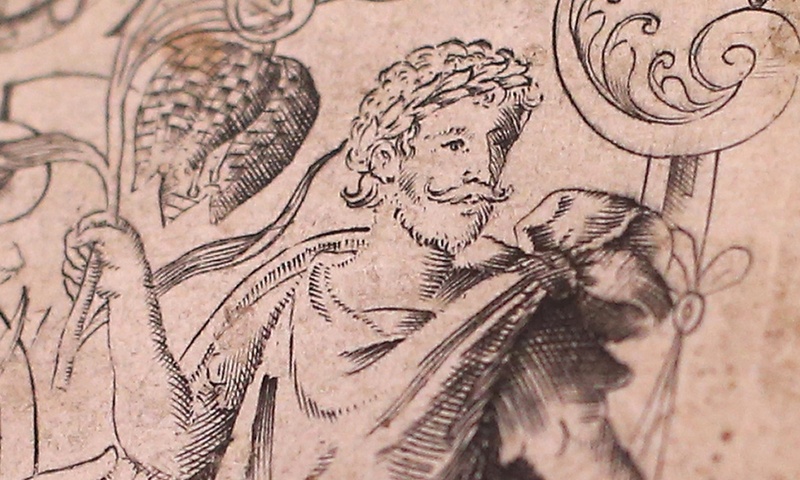 So it appears we now have a discovery that John Gerard commissioned an engraving in 1597 that included an image of a Roman Poet meant to indicate the author of Venus and Adonis, the new English Ovid, whom he knew to be Edward de Vere. It may be even more extraordinary than he knows…. The 400-pound gorilla in the room wonders What are the ramification of “Shakespeare” being encrypted in the first place? If the author’s name is hidden, does this not suggest a hidden author? Do Stratfordians now endorse the use of ciphers to extract Shakespeare from contemporary sources? Good point here, turning the mirror around so they can see themselves. Exactly! I have to say – the engraving looks like De Vere. Caroline Spurgeon wrote in “Shakespeare’s Images” that his nature descriptions were far more indicative of a gardener than a farmer. She picked this up for it was all over the works. Tom Reedy got so desperate he maintained Shakespeare that Shakespeare derived this knowledge from observing flower pots in London. This imo is close to a smoking gun. Very close. The figure is someone in their early twenties so it cannot be Shakespeare who was 33 in 1597 and it definitely cannot be de Vere who was 47. I wonder if it is The Earl of Southampton who would have been 24? It is in the South-East (E of South) corner of the picture, is that a clue? I think it is and that the rebus confirms it by spelling his name – HENRY WRIOTHESLEY. It goes H to E back to N down to R, then a large inverted Y. Then W R I O T H E L, inverted Y with the missing S and E supplied by the SE position. The fact that an ‘L’ is needed explains why the top bar of the ‘E’ is broken. That leaves us with the figure 4 to explain. Is the rebus also telling us his name is also ‘Vere’? It can also be read as 4 OR WRIOTHESLEY and in German four is vier. If his father was de Vere then who was his mother? In his left hand he is holding a cob of sweetcorn or maize. Is that telling us MA IS E (E for Elizabeth)? 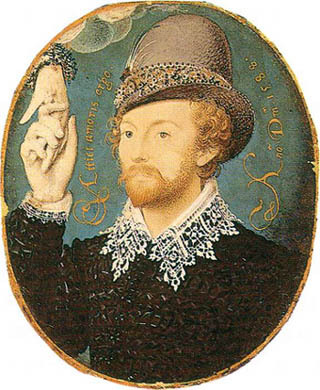 In his right hand he is holding a fritillary (symbolising a crown?) by his head. We can even find H IX (Henry the ninth) in the rebus. The top third of the thick line forming most of the inverted ‘Y’ is part of an ‘H’, the next third is an ‘I’ and the bottom third is part of an ‘X’. What makes you think the man depicted is in his early twenties? To me he looks like a person in his thirties or early forties – and this is most likely an idealised engraving – it is not to be taken at face value. We must not forget that our concept today of portraits is not the same as in the 1500’s. In the miniature of de Vere posted by you the moustache turns down. There is a miniature of Southampton where he has a beard and a moustache which turns UP just as that in the picture does. Hmm, and Southampton usually kept his hair long hair I believe. Can moustache up or down, have anything to do with what was fashionable at the time of the engraving/portrait? Thank you, Hank, for all your wonderful work on this great blog. I don’t know how much this will help to unwrap the mystery of the Gerard 1598 Herball title page drawing and rebus, but I wanted to add this—for whatever it might be worth. 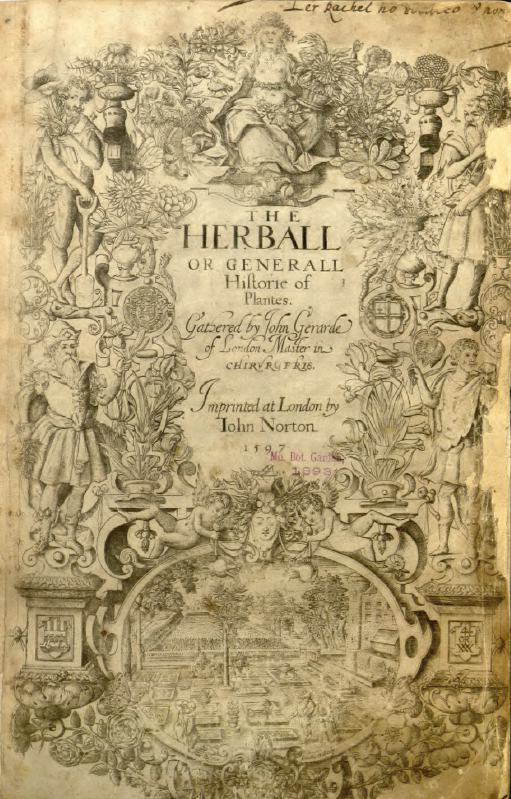 I agree with Mark Griffiths that the lower right hand drawing on the Gerard’s Herball title page drawing (dated 1597) is a drawing of the author Shakespeare theatrically portraying a character. I also believe this drawing is based on the real Shakespeare, Edward de Vere. The bays around his head indicate he is a poet. The flower in his right hand (to our left) is a ‘snakes’ head fritillary’ does point to the author Shakespeare and his first signed poem of ‘Venus and Adonis’. Mr. Griffiths is correct; I think that the other figures are also shown as ‘theatrical’ character portrayals—such as Lord Burghley as King Solomon. Some people have voiced concern/confusion as to why the fourth man in the far right corner believed to be the author would be holding an ear of corn in his other hand. The corn actually cinches the identity of the fourth man portrayal as Adonis. This is because Ovid in his ‘Metamorphous Book X’ has King Cinyras and his daughter Myrrha in an incestuous encounter during the festival of Ceres, the corn god and that encounter resulted in her giving birth to Adonis. I felt a bit sorry for Mr. Mark Griffiths who as a loyal Stratfordian honestly had no idea how the other half (anti-Stratfordians) are treated on a regular basis whenever they find/point-out/or in any way question the orthodox faith. Oxfordians were as unamazed as Mr. Griffiths was amazed by the immediate snap back from the orthodox side when he rolled out his new Shakespeare find. It might be interesting to write an alternative universe story about what would have happened if he had vetted it through the Stratford Birthplace Trust first. I have to think that had he done that there would have been a far different roll out that would have only taken place once a supposition that could hold a bridge (no matter how meager) to Lord Burghley—because there is no way they wouldn’t have seen all the blinking red lights screaming danger at the close proximity between the fourth man as Shakespeare and Lord Burghley across each other on the same page! Griffiths had naively believed that he could present what he had honestly discovered and that his fellow Shakespearean brethren would embrace him. Instead, he found himself immediately attacked by the Stratford orthodoxy and found his only allies among the infidels outside the Stratford temple. It appears that in his panic, after finding himself somewhere he never imagined, his panic led him to forget that his premise was that the figures were theatrically portraying characters. The character that Shakespeare was portraying was Adonis—the eternally handsome youth. It didn’t matter the age of the real model—be he “a hard living 47 year old” or a 33-year-old businessman from Stratford. Griffiths also made the unfortunate remark about the “realistically portrayed figure” an obvious exaggeration that came no doubt because of his shock and belief that he needed to push back forcefully. The drawings are no more realistic than Lord Burghley’s is and—the last part of his comment—that he (de Vere), “doesn’t resemble the known portraits of Oxford” is a bit embarrassing for him because the Stratford side says that both the Droeshout (an obvious caricature) and the present last iteration of the Stratford monument effigy are the only “authentic” portrayals of the author—I’ll put de Vere’s many portraits up against those two “portraits” any day to stand in comparison to the Herball title page drawing. So the artist wouldn’t have portrayed Edward de Vere as the 47 years old but as the more youthful man he was as Adonis and no Oxfordian will be surprised to learn that the final and longest denunciation in this updated May 22nd article—after giving the two lesser candidates that people had brought up for the fourth man; Raleigh and Drake. Griffiths saved the longest (60 lines) and harshest (to put it mildly) ending to the piece—building to a crescendo of truly biblical denunciation to prove his bona fides as true member of the Stratford church. Sealing it with, “Far from proving the theory that the Earl wrote Shakespeare’s canon, my discoveries kill it once and for all. He promising to be readmitted to the temple because he will manage to accomplish what all before him have failed to achieve. He will kill, once and for all, that cursed Oxford heresy and all its pesky and persistent heretics and their unworthy candidate. There are also two letters, “O” and “R,” divided by line running from this golden mean pyramid. The “OR” equals gold (from the French Or) which can also stand for golden sun*/son). *Since ancient times, the color of gold was associated with the brilliance of the sun. The line forming letters at the top and off to the right form the letters: “H”, “N”, and “E”. Using the “R” underneath these three letters gives “H”, “N”, “E”, “R”, and finally the “Y” under those gives the name HENRY. The “W” is at the base of the rebus. Take the “E” from above again and add it to the “O” on the left side of the golden line and you have “EO” which all Oxfordians know is how de Vere signed some of his early poetry, not to mention, he very much played around with “EO” in his poems. Again, take the “E” from above and add it to the “R” on the right side of the golden line and you have “E”(lizabeth) “R” (Regina) to make Elizabeth 1’s signature. You have Adonis “EO” and Venus “ER” and finally you have Henry W “OR gold/sun/son: “Thou art the next of blood, and ’tis thy right:” second line—next to last stanza of ‘Venue and Adonis’. Hopefully some of this will lead to further discoveries. Mark Griffiths – Honorary Oxfordian. Not sure if this is the correct place to do so, but I thought I would share a curiosity. I recently ran across a painting entitled “Queen Elizabeth Going in Procession to Blackfriars,” attributed to both Marcus Gheeraerts the elder and Robert Peake. In this painting there are only two men looking directly at the face of Elizabeth. One looks remarkably like Lord Burghley, and the other, carrying the right right front of the Queen’s sedan chair, looks remarkably like an adoring Edward de Vere (Lord Chamberlain, carrying the canopy?). There seem to be differences of opinion on the web as to the identities of the various courtiers in the procession. Curiously, an engraving of the painting was later made by George Vertue. The text that appears at the bottom of the engraving states, in paraphrase, that the original of this picture was painted in oil at the command of Lord Hunsdon and is in the possession of Lord Digby, who permitted a watercolor copy to be made…(wait for it)…for the Right Honorable Edward Earl of Oxford. Note that in the engraving, the face and direction of gaze of the right front sedan chair carrier is quite different. I don’t know what to make of it, if anything, but in light of the various theories about Oxford’s relationship to Elizabeth, his interest in this painting is…curious. Thanks very much, Scott. I’ll look into it and get back soon. Perhaps others will see this and comment. In any case, if it turns out to be more than “curious,” I’ll get it up on the blog page and credit you with it. Again, much appreciated and stay tuned. I believe there’s a lot more to this story than we know at this point — more than meets the eye, as they say. Thanks for calling our attention to the engraving and its reference to that later earl of Oxford. We could use some good rummaging in his papers. Thanks again! A sheepish thank you, Mr. Whittemore. A lack of due diligence on my part. It was the adoring gaze of the chair bearer in the oil painting that lifted my eyebrow and rushed me to comment. That’s quite all right, Scott. As a matter of fact, you have reminded me to look into that earl’s life much more than I have, so making the comment is entirely a positive contribution. I’ll keep you posted. (By the way, we still wrangle over that portrait and, far as I know, or can recall, no one in the so-called Oxfordian group has ever mentioned the Vertue engraving and its mention of Edward [Harley], Earl of Oxford — so I think I still mean to put up something on the blog, with credit to you. Again, my genuine thanks!